Use to be helmets with internal sun visors were not only expensive but ponderously large. Fitting the shield and its retractable mechanics beneath the helmet’s shell, while innovative, gave its wearer a severe case of Charlie Brown head. Nowadays, many helmet manufacturers have managed to offer helmets with internal sun visors equal in size to those without. 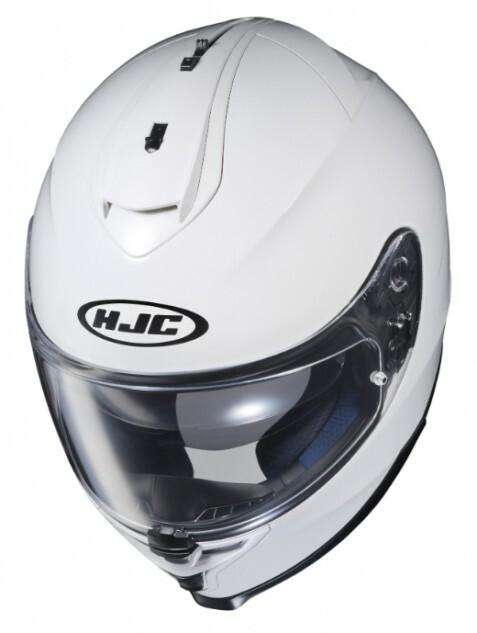 HJC’s done exactly that with the IS-17, but even more amazing is the retail price of the helmet: $180-$200. Yep, only $200 for a full-face helmet with graphics, a Pinlock-ready faceshield (Pinlock not included) and an internal sun visor. Compared to the IS-16 model being replaced, the IS-17’s retractable visor features dampers to soften the blow when the shield snaps back into place. Like the 16, the 17’s visor is adjustable to three levels, but in the short time we’ve had our test model the third setting’s become unattainable. We’re also not fond of having to reach around to the farthest rear portion of the helmet to engage/disengage the visor. Relocating the visor’s lever for easier reach is preferable but probably cost prohibitive. Also, we suspect the trench in which the lever operates may increase wind noise. Not deal breakers, but acceptably small inconveniences commensurate with budget-priced lids. Here you can see the sun visor’s engagement lever (sun visor deployed) directly behind the release button. The front, centrally mounted air intake can be opened to two positions. Venting falls within the realm of normal compared to other helmets. 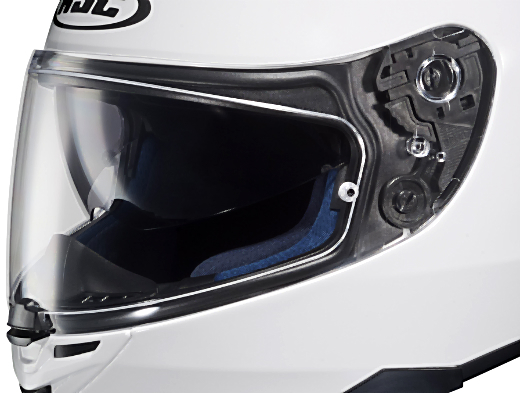 Like HJC’s RPHA Max modular helmet we reviewed last year (which has a similar sun visor and air intake arrangement), the IS-17’s faceshield has not a left-of-center thumb perch and locking mechanism, but centrally located ones. Can’t really say it’s a detriment or benefit, but a detour from what has become industry standard placement for the thumb perch and locking mechanism on most helmets. Fitment from the size medium we tested falls on the tighter side of comfortably snug but fit our oval-shaped noggin without inducing any distinct pressure points. The IS-17 uses two different shells and two EPS liners to create helmet sizes ranging from XS to XXL. The removable interior is the moisture-wicking SilverCool interior fabric and features pockets for communication device speakers. The faceshield seals tightly, while shield removal is easy via a small lever below the ratcheting mechanism. Note the centrally mounted thumb perch/shield lock. 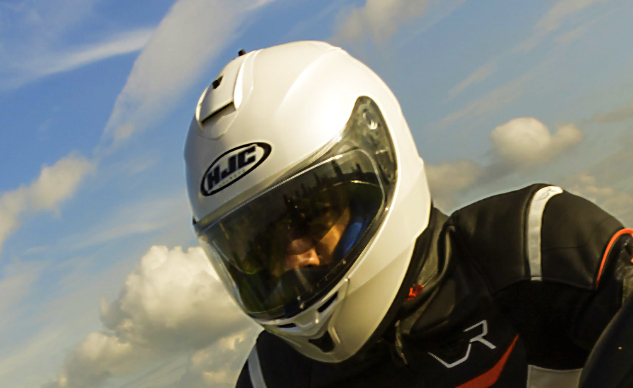 According to HJC the IS-17 is 150 grams lighter than the IS-16 it’s replacing and benefits from a new aerodynamic chin design meant to help reduce wind noise as well as create downforce to keep the helmet better positioned on a rider’s head. That may be true, but it’s impossible for us to verify with certainty. Like the 16, the 17 is constructed from a polycarbonate composite and meets D.O.T. safety standards. Considering the IS-17’s comfort and available features we feel it’s a good helmet in a sea of helmets, but it’s a great helmet for the price. Available in a selection of five solids or five graphics, the IS-17 is neither HJC’s basement bargain nor the company’s premiere lid. Stepping down one level gets you into HJC’s $150 CL-17, while stepping up means the $240 FG-17. Considering the amount of sizes and graphics available among this three-model range, that’s a helluva lot of helmets from which to choose all within $90 of one another. Happy shopping!